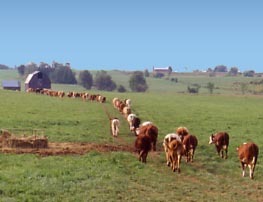 Grass-fed beef is the beef from cattle which live the entire summer on pasture, free to roam and graze as they please. During the winter, they eat only hay or "haylage". They are given no hormones or additives are used to promote extra growth. For these reasons, beef from these animals is healthy, wholesome and natural in every sense of the word. Over eons, cattle have evolved eating a high-fibre, forage-based diet. Cattle in feedlots are fed corn and grain because this is the most economical and fastest way to add weight. However, growing corn or grain for cattle can be harder on the environment, and produces beef with a higher level of saturated fats. 100% grass-fed cattle spend no time in a feedlot, and their meat is leaner and has a much healthier composition of vitamins and nutrients. Recent research backs this up. Learn More from this Australian study. Why don't we use routine antibiotics? Because our cattle spend their entire lives on free-range pasture, they have little or no chance to get sick. The majority of antibiotics in beef production are used in feedlots, where a large number of cattle are brought together from many different farms, which increases the likelihood of viral infections and sickness. As well, a number of infections occur when cattle walk through muddy areas to access drinking water. By fencing cattle out of all the natural waterways on the farm, we have virtually eliminated these infections. At the same time, this goes a long way to protect aquatic ecosystems. Studies have shown that cleaner drinking water leads to healthier and faster-growing cattle. However, we will, if necessary, treat a sick animal with antibiotics (one or two animals per year). We do NOT include these animals in our general sales. Why don't we use growth hormones or growth additives? Many of our customers are requesting beef raised with no supplemental growth hormones. Although there is no scientific data which proves that the use of hormonal implants in the beef industry is harmful, we strive to use the most natural production methods possible. Because added hormones are not part of the natural growth process, we choose not to use them. The pasture that our cattle graze offers continuous cover of the soil 365 days a year. A sustainable grazing system allows us to never have to till the soil and expose the earth to the elements. On our rolling fields, we strive to keep erosion to a minimum, and every year the top soil is enhanced by the nutrient cycling from our cattle. Many species other than cattle benefit from the continuous grass cover on this farm. As well, with grass-fed cattle, no fields are tilled or intensively cropped as is required for grain or corn production. Feedlot vs Grass-fed. What's the difference? A typical steak from the grocery store comes from cattle that have lived a portion of their lives in a feedlot. In a feedlot, hormones and antibiotics are commonly used. Cattle are fed a high-energy grain and corn diet, to acheive maximum weight gain in the shortest time possible. 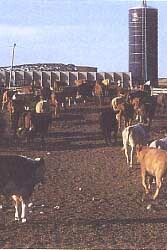 Many calves come to feedlots immediately after being weaned from their mothers. This introduces extra stress into their lives, resulting in a higher level of illness, requiring additional treatment. On our farm, cattle lead a very different life than feedlot cattle. Here cattle graze lush green grass in the summer, and are fed a forage diet throughout the winter. As they have all the space and fresh grass they need, these cattle are generally much healthier than their feedlot cousins. The cattle are given no hormones in their lifetime. The cattle are fenced out of any natural waterways on the farm, which makes for healthier cattle, a more sustainable environment and an enhanced wildlife habitat. -free ranged for their entire life. - raised on grass and hay, with no supplemental corn or grain. - given no supplemental hormones or growth additives.